Den historiska hamnstaden Malacca är en UNESCO världsarvslista och mindre än två timmar från Kuala Lumpur. Denna turné omfattar alla höjdpunkter, inklusive Melaka Straits-moskén, Porta De Santiago-fästningen, Malacca Sultanate Palace Museum och Malay Living Museum. Det ingår också en läcker lunch med traditionella Baba Nyonya-rätter. Really great tour. There was only my husband and myself so we had a private vehicle. The driver didn't speak the whole trip down to Malacca until we stopped at a rest area. He was very good showing us around Malacca. Lunch was lovely. 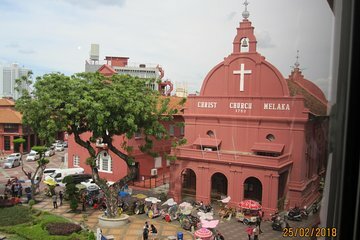 It would have been nice to be inform along the way of the history of Malacca.